Bodiam Castle is a National Trust property set in the heart of Rother. Dating back to the 14th Century, it plays host to a variety of events throughout the year. 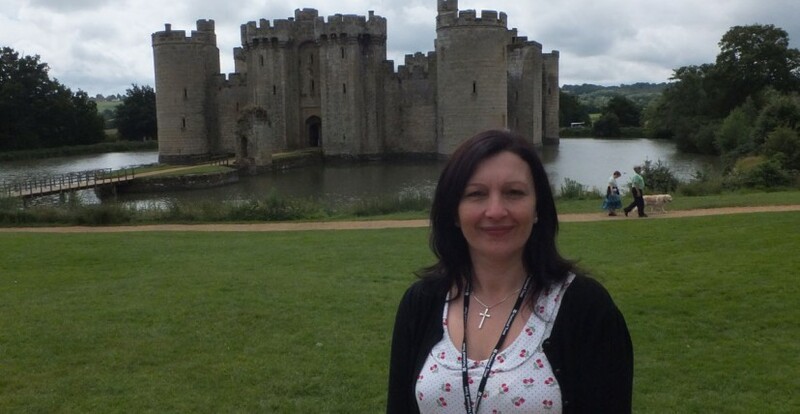 After seventeen months as a volunteer at the Castle herself, Karen Hammond took on her current paid role as the Volunteer Co-ordinator (Visitor Experience Officer-Volunteers) for Bodiam Castle & Winchelsea Countryside. “Although I had had some experience managing volunteers in a previous role, it was on a much smaller scale and for a different organisation. This Volunteer Co-ordinator role was not only new to me but also to Bodiam Castle so it was a whole new experience for us all and although I had support from within the organisation, I felt it would be good to have advice, guidance and support from an organisation that solely promotes and represents volunteering. I contacted Volunteer Centre East Sussex (VCES) after a recommendation from another National Trust (NT) staff member who had worked closely with VCES before and thought it would be of value and support to me. The individual support I have received has been invaluable, particularly being able to talk to someone impartial but who also understands the constraints in volunteering. This support has included, advice and support around role profiles, health & safety, legal issues, guidance on what to include in a volunteer handbook and policies, proof-reading and suggestions of ideas to take forward. When I had a specific issue with a volunteer, VCES gave me the guidance and support I needed to help me deal with the situation. The Volunteer Co-ordinators Forums managed by VCES have been a great way to network with other volunteer co-ordinators from different organisations and allows the chance to raise concerns and share thoughts on issues relating to your own volunteer programme and share and learn from each others’ experiences. Since working with VCES, I have supported and welcomed new volunteers and created an induction session to ensure they are prepared for their volunteer journey with the NT. Previously there had been no induction for volunteers. I have developed relevant training and development opportunities for volunteers and updated our existing role profiles which give volunteers clear outlines and expectations. I have set in place a new Access database (to support the properties, to maintain volunteer records and to manage volunteer involvement) and developed new volunteer roles as the current roles were restrictive. The new volunteer roles create more interest and allow more opportunities to those who might not otherwise choose to volunteer, feel unable to volunteer or go elsewhere. As a major volunteering organisation we want to be as diverse and fair as possible and the new volunteer roles have been extremely successful in terms of having a wider range and more variety of opportunities. As a result we have seen a considerable increase in volunteer enquiries and have increased our volunteer base. In turn we hope this will have an impact on our visitors experience with us. To read more about Bodiam Castle have a look at the Bodium Castle website.